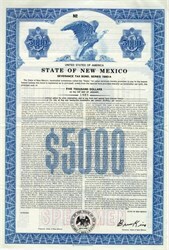 Beautifully engraved SPECIMEN certificate from the State of New Mexico New Mexico issued in 1980. This historic document was printed by the Northern Banknote Company and has an ornate border around it with a vignette of an eagle. This item has the printed signatures of the State Governor, Bruce King. 9 coupons attached on top. Bruce King (April 6, 1924 � November 13, 2009) was an American businessman and politician. He served three terms as the governor of the state of New Mexico. He was a member of the Democratic Party. King was the longest-serving Governor in New Mexico history with 12 years of service. Severance Tax is a tax imposed on the removal of nonrenewable resources such as crude oil, condensate and natural gas, coalbed methane and carbon dioxide. Severance tax is charged to producers, or anyone with a working or royalty interest, in oil or gas operations in the imposing states.